In Virginia, our state follows the Standards of Learning (SOLs...no kidding! ), and like teachers everywhere, we get stressed out around May when our students take their end of the year assessment. The pressure really is great, and we could spend hours debating the benefits. One thing we know for sure though...the tests aren't going away any time soon, so how to do prepare our short people to do the best they can and preserve their love of reading. I believe the answer is by teaching them to think like good readers through strategy instruction and mix up the way we present information in order for each to find a way to think about reading that works for them. Question-Answer Relationship or QAR for short was developed by Taffy Raphael, and the basic idea with QAR is to help students analyze questions and sort them by the type of question they best fit. 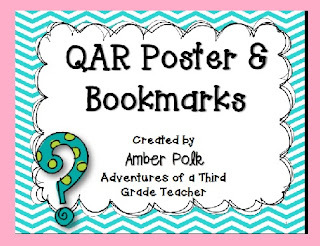 With QAR, students match questions with one of the four types- Right There (RT), Think and Search (TS), Author and Me (AM), and On My Own (OMO). To teach QAR, I model with a read aloud alouds and an assortment of question cards. We start by sorting them into two categories...In the Book or In my Head. We practice this with several mentor texts before breaking the questions down even more. After practicing with teacher made questions, I move on to having my students develop their own questions to go with their reading. They put them on sticky notes and we sort them on a chart I made (a four column chart). Another option is to have students pair up and practice reading, sorting, and answering each other's questions. To prepare for this blog post, I searched around some for resources you might be able to use in your teaching, and I liked this set from Adventures of a Third Grade Teacher, Amber Polk. The set has printable chart headers to use and put together a sorting board like I mentioned. She also includes a bookmark with question prompts which would be helpful to students in generating their own questions. 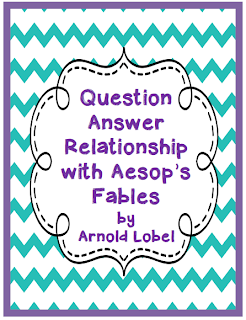 This set of questions, I used with my third grade students when we studied fables. The fables are short, so it worked well for small group instruction and modeling. This was a set that I found a long time ago. The only name I could find on the questions was in the word file, so with this set, I am sharing something I did not create, but was readily available on the internet. It was very helpful in planning for my third grade groups, and it addressed both questioning and Fable studies. 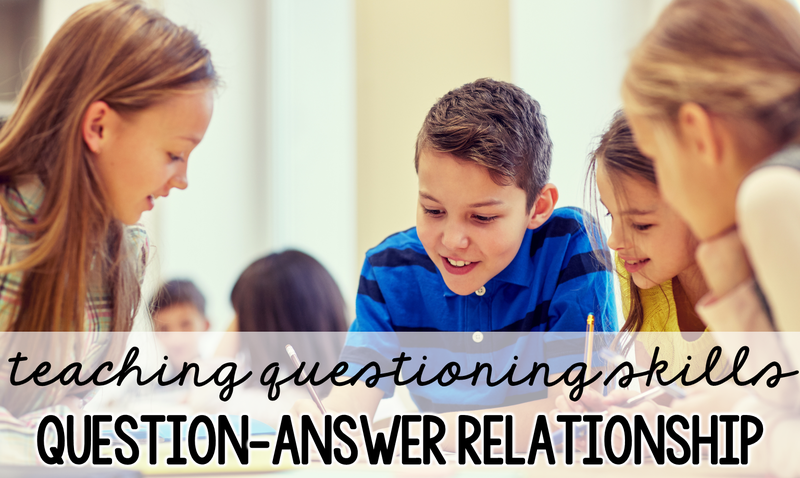 When students are ready to work in pairs to create their own questions, these question stems might be helpful. If you wish to do a jigsaw with these, you might cut the types apart and have teams use them to create questions about a sample text. As I have taught QAR, I have used a few mentor texts. The titles I have used are listed below. I think the best book choices for QAR are the books that lead to lots of discussion and inference. I think one thing all teachers could agree upon is that QAR is a deep topic. It's a strategy that can really help students think about their reading and improve their test taking skills. If you're in a testing grade, this is one strategy to explore further. I have barely touched on the topic, so stay tuned. I believe this will be an issue #1 post with a follow-up coming this weekend. Thanks for reading, and if you're a reading teacher or just love teaching reading, I hope you'll join in to share reading strategies that have helped your students. I love learning new tips and seeing different ways to present skills, so let's link up!! This is an excellent comprehension strategy. Thank you for sharing some great resources to go with it. I love the mentor texts you mentioned, although I'm not familiar with Tuesday. I'll have to check that one out. Hi Mary! If you know the book, Hurricane, it's the same author. I found online question cards to go with it to sort by type. I think if you Google the book and QAR, it'd show up.